Logistics & Automation | Products | MURATEC,MURATA MACHINERY, LTD.
We propose comprehensive logistics and automation solutions. In the mass consumption society, the people's needs are becoming more and more diversified. How can we provide these customers with a variety of products efficiently and timely? This is logistics, a major theme for most companies. In 1962 the Logistics & Automation Division (called Distribution Systems Division at that time) started to produce tool cabinets for various tools & materials in the plant. This storage system using cabinets has been expanded to the multi-storied automated storage system. 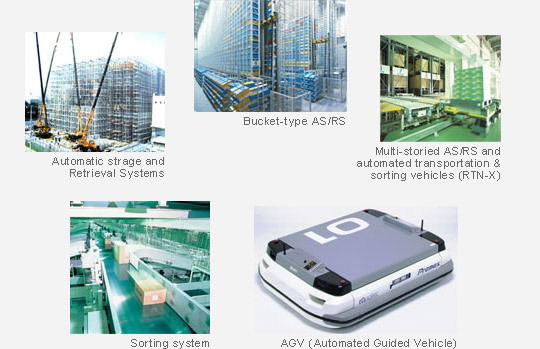 We combined multi-storied automated storage system with unmanned transport systems resulting in the consecutive creation of automated production processes to contribute to the prosperity of manufacturers. As logistics is now the most important theme for every company, Muratec is providing a wide variety of logistics and factory automation systems including hardware, software and engineering in the field of mail order, medical supplies, food, publication, apparel and transport. Muratec proposes comprehensive solutions to the customers' need.